Crane Service and Maintenance for OHT Cranes, Jib Cranes, Portal Cranes, Wire Rope Hoists & Chain Hoists. 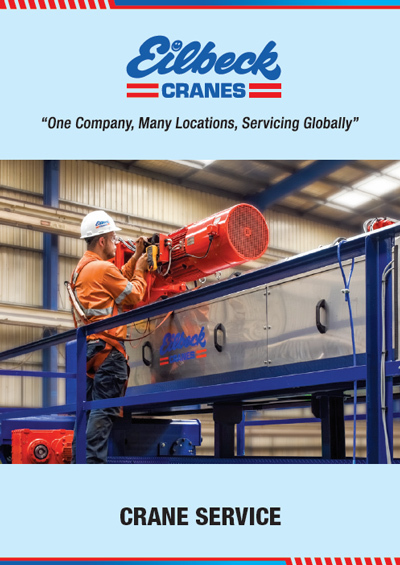 "One Company, Many Locations, Servicing Globally"
A 100% privately owned Australian company, Eilbeck Cranes has become an industry leader in the manufacture and service of Electric Overhead Travelling Cranes in the Australian market. As sole distributor for German crane company “ABUS” since 1989 in Australia, New Zealand, India, Pakistan and Vietnam, Eilbeck Cranes is one of the leading ABUS agents in the world. With manufacturing bases in Perth, Sydney and Mackay and service divisions in Perth, Karratha, Tom Price, Sydney, Newcastle, Brisbane and Mackay as well as agents in Darwin, Kalgoorlie, Adelaide, Campbellfield and Mt Isa Eilbeck Cranes has the capability to supply and service cranes in every region of Australia. Eilbeck Cranes is supplying and servicing cranes in remote and hostile environments such as LNG processing plants (EX cranes), Coal Washeries, Iron Ore Mines, Production Steel Mills, Hot Metal Furnaces, and the Construction Industry. Because Eilbeck Cranes is a leading manufacturer of cranes in Australia, our technicians have the advantage of seeing cranes built from the ground up and therefore have insight into the electrical and mechanical operation of the cranes. 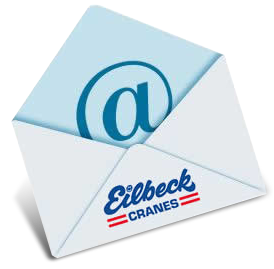 Eilbeck’s technicians and engineers attending site are trained and familiar with the many different types of cranes in addition to training on ABUS products and have access to Eilbeck’s extensive technical library. Through scheduled maintenance and inspection Eilbeck Cranes assists its customers fulfill their obligations for compliance to Australian Standards AS 2550-2011 and AS 1418-2011. Eilbeck can assist customers in determining the remaining life or Safe Working Period (SWP) of any crane which has changed its usage in accordance with AS 2550-2011 and provide solutions to recording any future usage to maximise the remaining SWP. 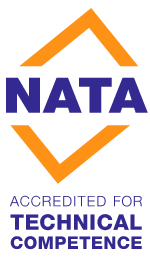 Our technicians and engineers are capable of carrying out major inspections to evaluate the potential of modernising your existing equipment to enable the customer to carry on working knowing that their equipment is working safely for a guaranteed period of time. Eilbeck Cranes offers complete product support through comprehensive technical representation and 24 hour on-call breakdown, repairs and spare parts facilities across Australia. Eilbeck’s Service Managers regularly work around our customer’s requirements when it comes to scheduling service and repairs whether it be night shift or on weekends. Eilbeck Cranes carries extensive stocks of ABUS spare parts in Australia and has full backup from ABUS Germany’s store with regular air freight shipments. At Eilbeck Cranes we provide more than a crane service, we can track the costs of your equipment, breakdown trends on your equipment and availability, which in turn allows you to meet your production needs and it assists you with budgeting needs. We pride ourselves as the Crane Company that sets common goals with our clients, who we like to think of as our partners. We work with our partners in not only setting Key Point Indicators (KPI’s), but meeting them also. We build relationships with our clients in order to achieve the best possible outcome. With accreditations in ISO 9001 and AS 4801 Eilbeck Cranes is committed to quality and safety in all aspects of crane service and repairs. Quality service technicians back up Eilbeck’s premium product with ongoing training in ABUS cranes, ensuring current, consistent expertise on a 24 hour, on call basis - always underpinned by a firm belief in quality, safety and world class capabilities. Correct crane service and training will translate to less operator errors, reduce crane misuse and possible damage, thus saving you time and money in the long run.